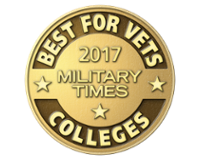 The University of North Carolina Wilmington ranks 58th on a national list of Best for Vets: Colleges 2017 by Military Times, an independent publication for members of the U.S. armed forces and their families. Among North Carolina colleges and universities, UNCW placed 3rd amid veteran-friendly colleges and universities. East Carolina University ranked 43rd and Western Carolina, 57th. Military Times ranked institutions according to factors including culture, academic quality, support for student veterans, cost and financial aid. More than 500 colleges and universities participated in the detailed survey. This is the eighth annual survey the publication has conducted in an effort to help veterans find a school that is a good fit. In September 2016, U.S. News & World Report ranked UNCW 11th on a list of Best Colleges for Veterans in the South. The university also has received recognition from Military Advanced Education & Transition Guide to Colleges & Universities and by SR Education Group, which publishes the Guide to Online Schools. UNCW was established after World War II as Wilmington College to address the needs of veterans returning to Southeastern North Carolina. Today, the university is continuously working to increase educational opportunities and support for military-affiliated students. Find information on programs, services, support and student involvement opportunities for active-duty service members, veterans and military families here. Among North Carolina colleges and universities, UNCW placed 3rd amid veteran-friendly colleges and universities. East Carolina University ranked 43rd and Western Carolina, 57th.